Diving deeper into politics, news, education, social issues, and more with one-on-one conversations from the heart of the Finger Lakes. Throughout the winter, Peter Mantius spent his days reporting on some of the most-important environmental issues facing the Finger Lakes region. Doing so with more than 20 years of experience - Mantius broke the story about the DEC's investigation into the Cayuga Regional Digester, and had an exclusive with the former facility manager who quit in January after he says he was forced to accept waste at the facility, which was not allowed. This week we caught up with Mantius for our Sunday Conversation. He's running for re-election, a plethora of new laws have adversely impacted the way law enforcement do their job in the Finger Lakes, and that election calendar has been bumped up due to changes in Albany. 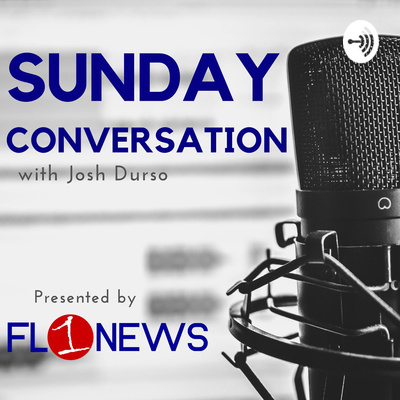 It's been a busy few months for Seneca County Sheriff Tim Luce, and this week he sat down with FL1 News Director Josh Durso to talk about his goals for a second term, and what's expected in the coming months. Last week a $175.5 billion spending bill was passed. Some lawmakers believe that bill, which was packed with a number of consequential pieces of legislation - is proposed that way intentionally by the majority. "This legislation simply wouldn't pass in a traditional, up-and-down vote," explained New York State Assembly Minority Leader Brian Kolb (R-Canandaigua). That said, it passed, and now taxpayers will have to live with the consequences. While recreational marijuana was not legalized - several other key provisions were included. Leader Kolb was in-studio this week discussing the budget outcome, and how it will impact residents of the Finger Lakes and Upstate New York as a whole. Exploring is one of the most-essential functions of human existence. Our curiosity is often sparked by the thing that's unknown, or the things we know less about. It's the pursuit of knowledge, information, and other people. It's been more than a half-dozen years since Chris Clemens founded Exploring Upstate. It's a blog, dedicated to exploring the 'best' the many region's of Upstate New York have to offer. He writes about history, food, unique trends in Upstate Life, and much more. And while it may seem simplistic in design: Travel to a community, talk to people in that community, then, write about the experience - it's one that has caught on. New York is big; and while many on the outside may think of New York City - when the state is mentioned - Clemens has found that the stories in unique, small communities Upstate are just as interesting. Check out the Exploring Upstate blog, and listen to him discuss his experiences, as well as a few newsworthy topics - like the boundaries of Upstate New York; and the ever-growing argument that New York is doomed, and losing it's ability to retain residents. Steve Griffin, CEO of the Finger Lakes Economic Development Center has been working in Yates County for more than a decade. And last year Penn Yan won the $10 million prize connected to the Downtown Revitalization Initiative - setting off a chain of events. That wasn't the County's first success, either. They boast the highest employment rate of the nine-county Finger Lakes region; and Griffin attests their overall success to a community-wide effort. Scream louder than the pessimists, he says. It's become a mantra for him to work by; and it's kept the community working hard to build a better tomorrow. An increasingly small number of people are 'satisfied' with the way government works. That's never been more true at the local level, where voters feel misled and misrepresented by the folks who have been chosen to serve. This week, W. Casey McDonald was in-studio talking about a new initiative he recently launched to re-engage, and re-energize those who feel frustrated. His effort is called "Life of the Party" and is a platform aimed at finding new leadership for local committees, which ultimately play a huge role in local and regional leadership. Listen to what he had to say about changes coming locally, and what he hopes to accomplish through Life of the Party in the coming weeks, months, and years. A recent New York Times piece looked at young people and their affinity for 'hustle culture'. Is it healthy? Is it creating a generation of workers who dislike, or worse yet, hate their jobs? A link to that story is below, but this week Maria Coleman joined Josh Durso for FingerLakes1.com's Sunday Conversation. They discussed the state of social media, how it impacts users - particularly those who's careers and jobs are fused with personal life via social media, and what some solutions might look like for scaling back, or more responsibly using social media. NYT STORY: Why Are Young People Pretending to Love Work? Wayne County Sheriff Bary Virts discusses the challenges of running a department that's mid-contract negotiations, and also coping with the widespread shortage of law enforcement prospects. He also tackles some of the statewide initiatives that could prove to be difficult for law enforcement to manage - like the controversial mugshot proposal, which would ban law enforcement agencies from releasing arrest information or mugshots. Virts also discussed the possibility of legalizing recreational marijuana, and pointed to a number of surveys and studies, which outline concerns around 'drugged driving'. When Jim Meaney founded the Geneva Believer - his goal was to inform city residents of the inner-workings of government. Over the years he has covered a string of important, relevant issues; and most-recently his coverage of the city manager search process, policing and intended reforms in Geneva, and Finger Lakes Health have really spotlighted the importance of this work. He was in-studio this week for FingerLakes1.com's Sunday Conversation. Stephen Parker Zielinski has served as Superintendent of South Seneca Central School District for enough years to learn a lot about students, education, and the growth that is undertaken as student, faculty, and administrators evolve. He sat down with Josh Durso, FingerLakes1.com News Director to discuss the future of his district, and some of the larger trends in education. This week, longtime Victor Town Supervisor and Ontario County Board of Supervisors Chairman Jack Marren sits down for an exclusive, in-depth conversation about local issues, ramifications of statewide changes, and the upcoming election cycle, in which he'll be seeking another term as supervisor.